Test Do something different this weekend ... discover Steampunk! Do something different this weekend … discover Steampunk! 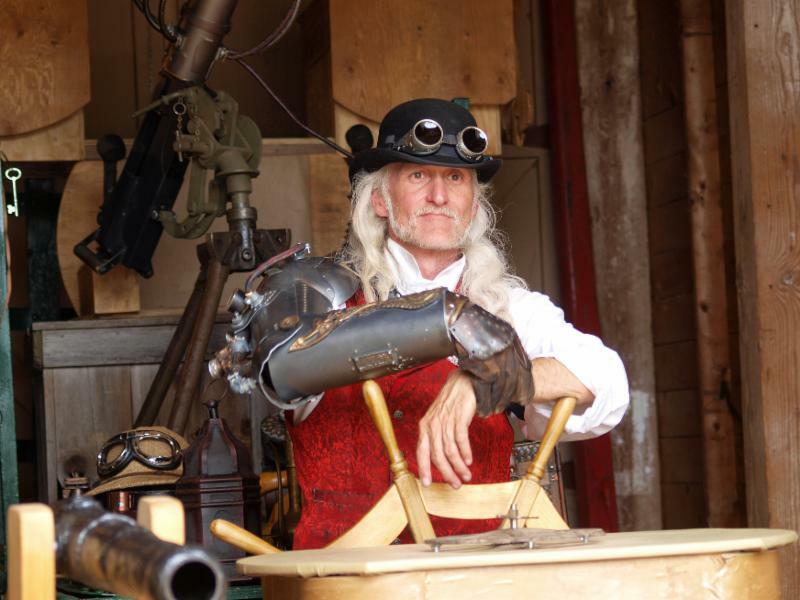 Steampunk Day returns to Cowtown for the fifth year in a row to give visitors a one-of-a-kind Victorian science fiction experience straight out of a Jules Verne or H.G. Wells novel. Activities for the entire family are scheduled all day. Download the schedule of events here. This year’s featured act is Carnival Epsilon, a madcap group of sword swallowers, fire eaters and other sundry performers from Tulsa, Okla . Visitors may join in the fun and wear their own Steampunk attire, but it’s not a requirement. The day is all about families having fun and immersing themselves in an alternate history that couldn’t come alive at a better location than Cowtown. Cowtown is offering many activities this summer that turn “city kids” into “farm kids.” Your children will have such a great time with friends playing 1870s games, tending to a farm and pretending to be cowboys/Victorian girls that they will forget they are learning about history. Tuesday Time Travelers (1st and 3rd Tuesdays, June through August) are open to any child! You have your choice of a morning program, 9:30-11:30 a.m., or an afternoon program, 1:00-3:00 p.m. Registration is $4. Sign up by calling 316-350-3317 or complete the online form. Victorian kids found ways to have fun without computers and electricity, and your child can, too. We’ll introduce them to different toys and games that will be more fun than they ever imagined. It’s true that farm kids worked hard to help the family. When the work was done, though, they didn’t forget about having fun. Our Tuesday Time Travelers will balance hard work and play to see if they have what it takes to be farm kids. Hunters and cowboys had special skills that helped them live on the prairie. We’ll share their secrets with our Tuesday Time Travelers to see if they are ready for prairie life. If you are looking for summer programs for groups of 14-25 children, Cowtown offers two-hour programs from 10:00 a.m.-noon or 1:00-3:00 p.m., Tuesday through Friday. For questions and date availability, call 316-350-3317.